Tarja Halonen is the former President of the Republic of Finland (2000 – 2012). She was the 11th President of the Republic of Finland and Finland's first female head of state. Tarja Halonen was born in Helsinki at the Christmas Eve in 1943. She graduated from the University of Helsinki in 1968 and has a Master of Laws degree. Her professional career started in the national Union of Finnish Students, where she worked as the Social Affairs Secretary in 1969-70. She started as a lawyer in the Central Organization of Finnish Trade Unions in 1970 and held this position throughout her political career. Tarja Halonen joined the Social Democratic party in 1971. Her political career began in 1974 when she was appointed parliamentary secretary to the Prime Minister. Tarja Halonen was elected to the Parliament for the first time in 1979, and after that she was repeatedly-elected four times, until she assumed the office of the President of Finland. In the Parliament she served as Chair of the Social Affairs Committee in 1984-1987, Deputy-Chair of the Legal Affairs Committee in 1991-1995 and Chair of the Grand Committee in 1995. A part of Tarja Halonen's political activity has been her five terms in the Helsinki City Council in 1977-1996. Tarja Halonen has served in three cabinets and her appointments have been: Minister at the Ministry of Social Affairs and Health in 1987-1990, Minister of Justice in 1990-1991, and Minister of Foreign Affairs in 1995-2000. She was also Minister responsible for Nordic co-operation in 1989-91. During her time as Foreign Minister, Finland held for the first time the EU Presidency from July to December in 1999. Tarja Halonen has also played an active role at the Council of Europe, first as Deputy-Chair of the Finnish Delegation to the Parliamentary Assembly from 1991 to 1995 and later in the Ministerial Committee. She was also a Member of the Committee of Wise Persons of the Council of Europe in 1989-99. 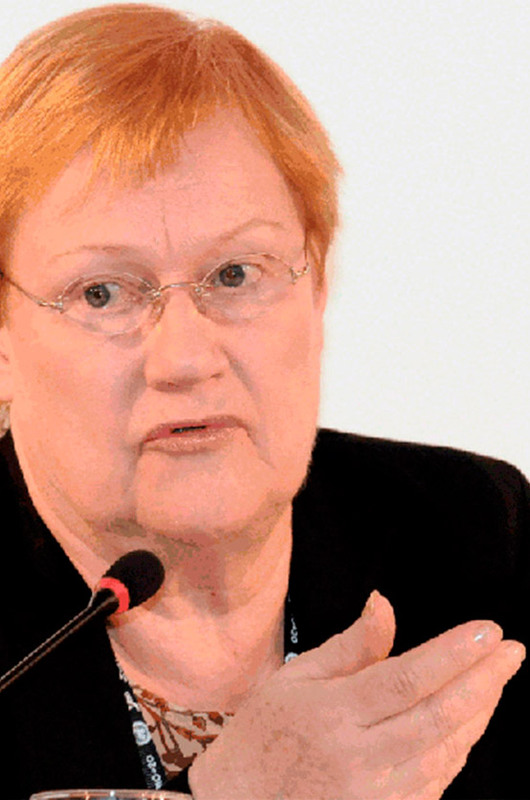 During her presidency Tarja Halonen has served as co-chair of World Commission on the Social Dimension of Globalisation, appointed by International Labour Organization ILO, from 2002 to 2004. Since March 2009, she has served as the Chair of the Council of Women World Leaders. In August 2010, Tarja Halonen was appointed co-chair of the UN Secretary-General’s High-level Panel on Global Sustainability. Tarja Halonen has paid close attention to issues of human rights, democracy and civil society. Issues concerning social justice and promotion of equality have been central themes throughout her political career. Tarja Halonen has one daughter. Her huspand is doctor Pentti Arajärvi. The family consist also his 3 children and 4 grandchildren. Tarja Halonen is intrested in theatre and she has held several honorary positions in this sphere. Her other interests include arts. She is fond of painting, drawing and gardening among other things. She has also been closely involved in rhythmic gymnastics and she enjoys swimming.